Dr. Bruce Trimble now accepts new patients, including those who lack referrals, to his practice for smile makeover procedures in Menomonie, WI. Dr. Trimble offers various cosmetic dentistry treatments such as dental implants, orthodontics, teeth whitening, crowns and veneers to help patients improve their smiles and self-esteem. Dr. Bruce Trimble is currently accepting new patients with or without referrals to his practice, Trimble Dental Excellence, for smile makeovers. Dr. Trimble utilizes restorations, dental implants, teeth whitening and various other cosmetic procedures to give each patient a customized smile makeover in Menomonie, WI. These full mouth reconstructions can correct a number of undesirable dental conditions, including tooth misalignment and discoloration as well as issues that can cause health concerns such as missing or damaged teeth. Dr. Trimble offers a number of procedures to accommodate each person’s needs, and he works closely with every patient to develop a thorough and personalized treatment plan. For those who live with tooth staining or discoloration, Dr. Trimble offers teeth whitening as well as veneers. When choosing veneers or crowns, Dr. Trimble can also conceal more severe cosmetic problems, including chipped or crooked teeth. Dr. Trimble also provides patients with a number of long-term solutions, including orthodontic treatments to address tooth misalignment and dental implants to replace damaged or missing teeth. Dental implants are a long-term tooth replacement option that restores patients’ smiles with a customized natural-appearing implant, while also helping maintain proper bone density in the jawbone. As an experienced smile makeover dentist, Dr. Trimble appreciates the impact a patient’s smile can have on his or her self-confidence, and he is proud to make these procedures available to more patients in his community. In addition to accepting new patients, Dr. Trimble is currently offering complimentary initial consultations, along with financing options to help patients achieve their ideal smiles sooner. Dr. Trimble routinely provides treatments such as sedation dentistry to make a smile makeover in Menomonie, WI, more attainable for people who suffer from dental anxiety or phobia. Patients who want to learn more about dental implants, teeth whitening, orthodontics or any other cosmetic dentistry treatments that Dr. Trimble offers are encouraged to visit the website of Trimble Dental Excellence at http://www.trimbledental.com. People who are ready to schedule a consultation regarding a smile makeover in Menomonie, WI, are urged to directly call the practice today at (715) 802-4360. Trimble Dental Excellence is a general practice offering personalized care for patients in Menomonie, WI. Dr. Bruce Trimble offers a variety of services, including advanced dental implants and sedation dentistry. 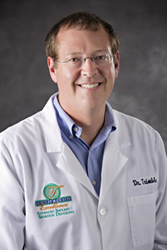 Dr. Trimble is a graduate of the University of Minnesota and has dedicated his professional career to providing you with the best that dentistry has to offer. He is continually educating himself and his staff on the newest techniques and advances to offer you state-of-the-art, antiseptic, personalized & comfortable dental care. Dr. Trimble is a fellow of the International Congress of Oral Implantologists & the Misch International Implant Institute. He is also among the few dentists in Wisconsin who are licensed for IV sedation and has received a certificate from the Temple School of Dentistry for Surgical Oral Implantology. To learn more about the services offered at Trimble Dental Excellence, please visit their website, http://www.trimbledental.com or call (715) 802-4360 to schedule an appointment.